It has been a month since my last post, craziness of life sometimes gets in the way of blogging but my daughter’s soccer team is done, birthday parties including my 40th are done for the year and you should see more posts over the next several weeks. The long Maine winters are a great time to blog. This one from Jack’s Abby continues a string of beers from Massachusetts that will continue as I am doing more and more business down that way. 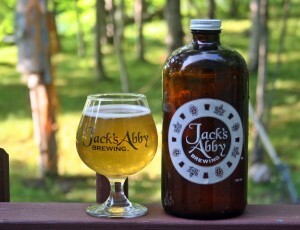 Look for more reviews of Trillium, Mystic, Night Shift and hopefully more from the guys at Jacks Abby too. Sour Barrel Project #5 is a wine barrel aged version of Leisure Time and was available at the brewery for growler fills this summer. Appearance is a nice light golden color with minimal head which is pretty typical for a sour beer. Aroma is mild but has some earthiness along with hints of wheat and spices. Taste was light on the sour and had little to no wine barrel character but it did have some spice and a light tartness that worked well. There was nothing about this beer that really stood out but everything about it worked making it a very enjoyable beer and something that would be a great intro to wild/sour beers for craft beer drinkers that are interested in the style but don’t want anything too crazy. Brewers Description: Leisure Time aged in red wine barrels with brettanomyces, lactobacillus, and pediococcus for 12 months.